Each TextureGroup entry defines the texture properties for a specific texture set as used in the game rendering. Grouping textures into common sets allows for better control over the texture memory pool use by various game texture resources. MinLODSize Minimum mip size that will be rendered, specified in pixels, range of 1 to 8192 as power-of-two's, must be less than MaxLODSize. MaxLODSize Maximum mip size that will be rendered, specified in pixels, range of 1 to 8192 as power-of-two's, must be greater than MinLODSize. LODBias A negative or positive value that determines the number of mip levels to offset prior to uploading for render, clamped within MinLODSize and MaxLODSize. 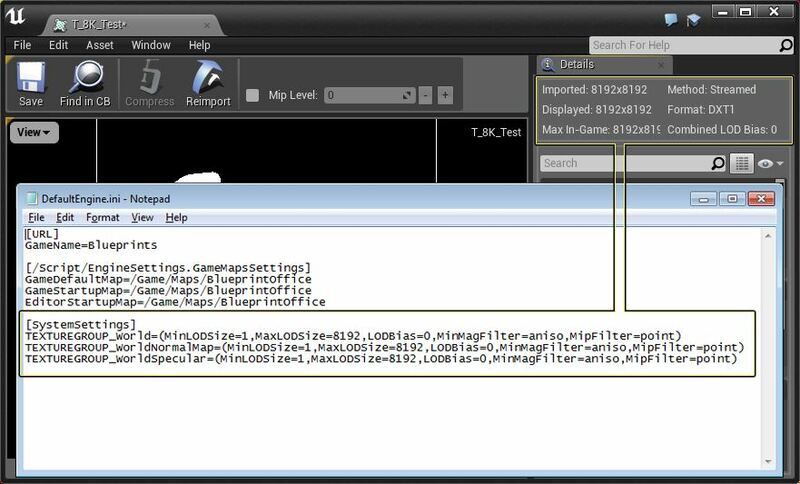 MinMagFilter Specifies the texture filter type when textures are minified or magnified by the GPU. See the chart below. MipFilter Specifies whether the GPU should blend two mips together when viewing the texture from a distance or at a grazing angle. See the chart below. NumStreamedMips The number of mips that are allowed to be streamed in or out. If a texture has 10 mips and NumStreamedMips is 2, only the 2 highest mips will be allowed to stream in or out. The texture will therefore have 8-10 mips in memory at any given time. Setting NumStreamedMips to 0 means that no mips will be streamed and the textures using this LOD group will always be fully loaded. Setting NumStreamedMips to -1 means that all mips are allowed to be streamed in or out (there are still other restrictions that apply though). NumStreamedMips is an optional setting that defaults to -1. The TextureGroup and LODBias settings specified in the config ini files, along with the LODGroup and LODBias settings specified in the Texture Properties determine the final set of texture mips used for an individual texture. Any textures assigned to the TEXTUREGROUP_World LODGroup will use these settings to determine the mip range used for rendering. The additional LODBias setting in the Texture Properties is additive with the LODBias specified in the config ini file TextureGroup. The LODBias biases or offsets which mip is chosen for rendering. The LODBias is calculated before the LODGroup Min/Max range. The LODBias in the Texture Properties is added to the LODBias in the TextureGroup to determine the final LODBias value used. A LODBias of 0 is the main (native) texture resolution. A LODBias of 1 is the first mip down for the texture, a LODBias of 2 is the second mip down, etc. For example, a 1024x1024 texture that has a LODBias of 1 results in the 512x512 mip being chosen for rendering. The LODBias specified in the Texture Properties for each individual texture can be positive or negative, so that it can offset the TextureGroup's default LODBias to either higher or lower mip values. A TextureGroup LODBias of 0 and a Texture Properties LODBias of 0 would result in a final LODBias of 0. A TextureGroup LODBias of 0 and a Texture Properties LODBias of 1 would result in a final LODBias of 1. A TextureGroup LODBias of 1 and a Texture Properties LODBias of 1 would result in a final LODBias of 2. A TextureGroup LODBias of 1 and a Texture Properties LODBias of -1 would result in a final LODBias of 0. After the final LODBias is calculated, then the texture mip is checked to see that it fits into the TextureGroup's Min/Max LODSize range, and it is adjusted if necessary. This allows a simple config ini file change to effectively clamp a specific TextureGroup to within a set min/max LOD range. For example, a 1024x1024 texture with LODBias of 1 uses the 512x512 mip, if it is in the TEXTUREGROUP_World LODGroup as shown above, it is then checked to see if it fits within the TextureGroup's Minimum and Maximum LODSize range, which in this case is 256 and 1024. Since each game title will have its own unique TextureGroup settings, artists and level designers should be aware of the MinLODSize and MaxLODSize for each group. It would increase distributable package size with no rendering quality benefit if a game shipped with 2048 textures assigned to a TextureGroup with a MaxLODSize of 1024. For an explanation of the meaning of the various texture properties, see the Texture Properties page.